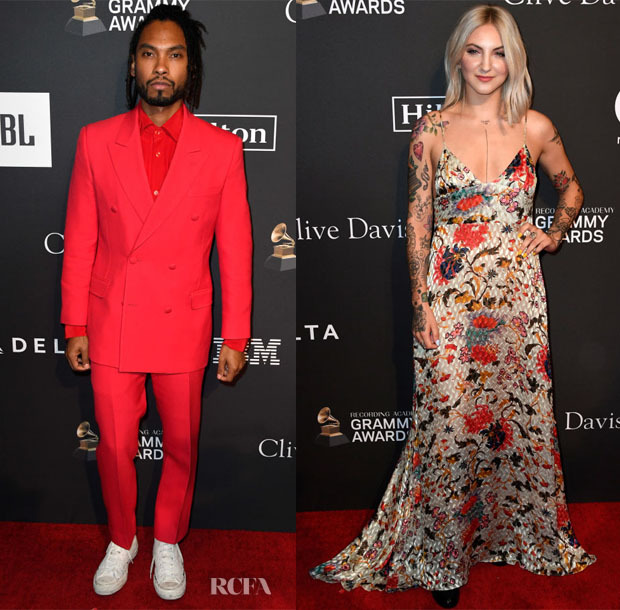 Celebrities were in the party spirit at Clive Davis’ 2019 Pre-GRAMMY Gala on Saturday (February 9) in Beverly Hills, California. ASAP Rocky: He was popping in a pink Loewe Fall 2019 suit. There will be people who’ll object to the exaggerated oversized proportions, but he made the look his own with his styling and pearly jewellery. Rita Ora: Never one to disappoint in the drama department, the singer was encircled in whimsical embellishment in Yanina Couture Spring 2019. Her finishing touches play into the flowing ensemble without competing. Miguel: The ‘War & Leisure’ singer’s bold red suit and coordinating shirt had a commanding presence, but the impact was totally lost with the horrible shoes. Julia Michaels: The chanteuse’s Adriana Iglesias dress had a mesmerizing kaleidoscopic effect with the textured material and pattern. It was bohemian without being cliché. Bebe Rexha: She made a dramatic entrance in a sculptural August Getty Atelier Spring 2019 look with a Hearts On Fire necklace. The jewels played into the pattern, but a bare neck would have kept the focus firmly on the sweeping skirt hem. Ellie Goulding: The English singer was outfitted in an intricately decorated Chloe Resort 2019 ensemble. The ombré shoes coordinate with the tones, but they might lose the look some fans. Ciara: Her Romona Keveža Spring 2018 gown certainly didn’t lack sensuality with the racy slit and slashed neckline. Angela Bassett: It takes one a second to figure out exactly what is going on here. The dance inspiration is evident, but it’s beginning to feel more like a performance piece. Maren Morris: The country singer didn’t overdo it in a breezy Giamba Pre-Fall 2019 ensemble. A different bag would have brought out the shimmering stripes. Dua Lipa: The prim bow and silhouette was brought to life with the bold blue fabric. Had it been crafted in a pastel, it would not have had the striking impact this look presents.